Imagine knowing that you are embarking on a downward spiral but being powerless to stop it. Sounds horrifying, right? It is, and it’s exactly what happened to Susannah Cahalan, a 24-year-old New York Post reporter. What began as a bite mark and a few overreactions quickly led to seizures, physical and mental deterioration, and to a troubling diagnosis. Was it because she drinking too much? Having a nervous breakdown? A psychotic break? Was she schizophrenic? Bipolar? With a full spectrum of symptoms that fit into a number of conditions and disorders, the Susannah friends and family knew and loved had disappeared. Brain on Fire: My Month of Madness is the fascinating story of Cahalan’s journey to hell and back. Because she has no memory of her experience, she has reconstructed in her memoir her lost month by relying on videotapes, journals, and interviews with friends, family, and doctors. From paranoia, seizures, hospitalization, hallucinations, and short-term memory loss to the misdiagnoses and road to recovery, she holds nothing back. The result is an incredible story that is impossible to put down. As brutal as this book is (which I happened to start on March 16, the day she entered the hospital in 2009), the fact that she was able to write it is an indication that it has a happy ending. It’s also clear that Cahalan is, by trade, a writer. Whether it’s her writing style or the story itself, I eagerly raced through the pages with awe and wonder at what she went through and where she ended up. She leaves no stone unturned, discussing how the experience changed her relationships with her previously distant father and new boyfriend and its impact on her job. She also chronicles her recovery, detailing awkward social exchanges, going back to work, and how the experience changed her life in ways she is still realizing. It’s a stunning story but it’s also a painful one, filled with terrible experiences she asserts she wouldn’t wish on her worst enemy. 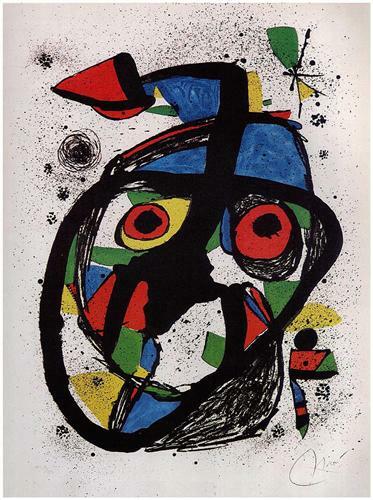 Carota by Joan Miró stayed with Cahalan throughout her ordeal. When I was browsing reviews for Brain on Fire, I came across mostly positive ones. That said, I came across a few that said the book’s focus on the medical side of things was overwhelming. I completely disagree with this assertion. In a book about a disorder affecting the brain, medical jargon is an absolute must for a reader to fully understand what happened to Cahalan. I found her approach to the terminology and explanations to be casually and seamless integrated into the story and would hate for someone to skip this book based on a fear of it being too “academic” in its descriptions. Now that I’ve warned against that particular warning, you have probably figured out that I haven’t shared what her eventual diagnosis was or how she got sick in the first place. That’s because I went into this book not knowing the details and think it was a more powerful page-turner because of it. In not knowing, I went down the rabbit hole with her, complete with the confusion and awareness (or lack thereof) that came along with it. While I’ll never truly be able to grasp the horrors that she went through, I was able to catch a glimpse of it. Whether you know the cause or not, I highly recommend this book. It’s raw, honest, heartbreaking, and uplifting all at the same time and I’m better off for knowing her story. Recommended for: Memoir fans and anyone who is interested in how your brain and body can fail you.